The Olympic bell was heard for the first time at the 1936 Olympic games in Berlin. "The Olympic Bell is the bell of peace"! 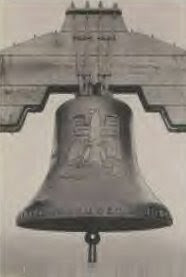 On the side of the bell is the inscription "Ich rufe die Jugend der Welt!" (I call the youth of the world). The Olympic bell on which can be found the Olympic rings with the German eagle superimposed became the omnipresent symbol of the Berlin Games. The Olympic bell in Berlin rang for the last time in 1945 when it was used as a gunnery target which rendered it useless. The modern torch relay was introduced by Carl Diem president of the organising committee of the 1936 summer olympics in Berlin, as part of an effort to turn the games into a glorification of the Third Reich. 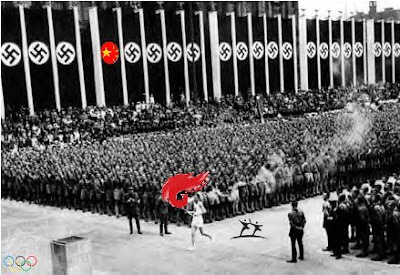 The totalitarian regime of China who have already cast a new Olympic bell and with the tacit approval of the British Prime Minister, Gordon Brown, will be allowed to parade the torch in the streets of London to the glorification of The Labour Party.